Though social media networks such as Facebook and Instagram play an increasingly central role in the marketing efforts of many companies, those marketing efforts play an equally central role in social networks’ revenue streams. So it should come as no surprise that Facebook, Inc. has invested plenty of time and money into figuring out how it can help marketing clients reach users, the company’s product marketing manager Kristen Jones told listeners during a presentation at the company’s recent F8 conference: it even sent representatives around the world last year asking businesses how it could help them grow. Fortunately, Facebook offers marketers plenty of tools for doing so, she added, before presenting three guidelines that Facebook recommends advertisers follow if they wish to reach its core social network and Instagram users most effectively. Facebook wants its marketing clients to know the value of every dollar they spend, and consequently take measurements and objectives very seriously, Jones said. 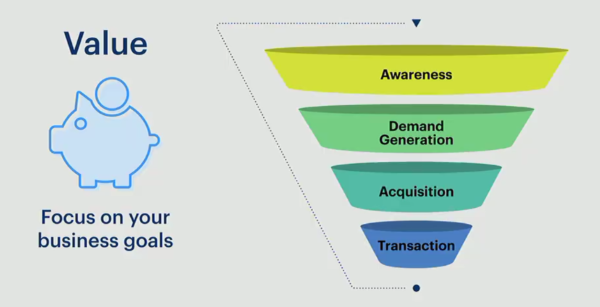 The company encourages advertisers to approach social media marketing like a funnel – at the top is consumer awareness, followed by demand generation, then acquisition, then transaction. The further you go, the closer you are to the customer making a purchase, but it’s important to pay attention to every step, with different campaign objectives for each one. “Each time you create a campaign, you should step back and think, ‘what is it that my business goal is, and am I aligning it to the right advertising objective? '” Jones said, noting that, for example, the consumer awareness stage should have different goals than the transaction stage. During her presentation, Jones showed a Carnival Cruise ad that used Facebook’s Canvas app to show customers what a vacation on one of their cruises could look like: an example of creating awareness. Canvas could also be used by marketers to increase demand, she said, with the app’s carousel tool working particularly well, because it allows users to scroll through multiple products in a single ad. With a diverse range of measurements available, advertisers can set objectives based on a video’s viewership numbers, regional audience, local awareness initiatives, and brand awareness, among others, and track the characteristics of users who visit their company’s website or engaging with its app. “With a couple of taps on a mobile device, a person can actually tell you that they’re interested in your business,” Jones said. This user information can then be incorporated into targeting efforts – central to Jones’ next guideline. Facebook offers its marketing clients many different targeting options, Jones said, allowing advertisers to approach users based on their interests, behaviours, demographics, or location – but if you’re not sure where to start the best choice might be the platform’s custom audience and “lookalike” features, which allow advertisers to apply the data they have on existing customers to future targeting parameters, or have Facebook automatically target users who resemble the customers your company already has. However, precision-based marketing is not only about targeting, it’s about taking advantage in a creative way. “We take [precision marketing] very seriously at Facebook, because you’re reaching people on devices that they’re using to engage with people every single day in their personal lives,” Jones said, noting that if marketers want to reach Facebook users as effectively as possible, the ads they deliver must feel equally personal. Fortunately, the company helps clients out by assigning “relevance scores” to every user and every ad that enters its system, assigning tags such as “enjoys entertaining,” “likes live music,” “hikes and bikes,” “buys organic and local,” “early adopter,” “college graduate,” and matching ads with their ideal audiences accordingly. “The more relevant your ad is to the target audience you’re trying to reach, the better your ad will perform in our option system, the higher the clickthrough rate you’ll receive, and the lower the cost it will have,” Jones said. A sample business relevance score. Another important factor to keep in mind the difference between users who have never heard of your company versus unofficial “brand advocates”, Jones said – in video game terms, you should be taking a different approach with someone who’s never played your game versus someone who is 20 levels in. For example, she said, a company interested in targeting a particular woman is better off tracking her activity as she goes from her work computer to her smartphone to her tablet to her desktop at home, rather than relying on separate cookies for each device – and Facebook provides two services, Pixel and App Events, that make doing so much easier: the former allows advertisers to monitor user activity across devices, while app events allows them to check when someone has, for example, visited a product page or abandoned their shopping cart. You can watch Jones’ full presentation here.